Developer Three Fields Entertainment had a pretty decent start with Dangerous Golf, with previous Criterion employees I was really looking forward for Danger Zone because it had the same gameplay concept from Burnout’s crash events. So is crashing your car still a fun thing to do? Put on your seat belt and let’s find out in this Danger Zone review. Danger Zone’s gameplay is pretty easy to explain, you drive a car and you crash against other cars to cause as much destruction as possible. It remains cool to see a massive crash and it is easy enough for everyone to enjoy. The set-up also makes sure that you can play Danger Zone for a few minutes, making it the perfect game to play when you have less than an hour time. To my surprise, and I realised it after playing for a while, the game remains fun, despite the repetitive gameplay, because the clever idea to make it a little bit more like a tactical puzzle game. Reaching the Gold or Platinum medal will require some smart thinking to get all bonus cash and cause enough havoc to reach big enough points. A nicely timed smashbreaker (explosion) is the difference between a bronze or gold medal. The process of finding the correct path is a fun one, although you need a good dose of luck too. Damn, that can never be good. Where are all the prisoners from the prison bus? LOCK YOUR DOORS! Even for an arcade game the vehicle physics and handling are basic, it seems that they didn’t really do much effort in changing things up. Driving a Taxi or high-speed racing car isn’t much different besides the acceleration. The game is set-up in a way that it doesn’t really matter but still, I would have loved some extra variation. I told the taxi driver I needed to be on time, I still regret that i mentioned that. He went into a frenzy and used explosives to jump over bridges. Like I previously said the game looks absolutely stunning in 4K (Xbox One X) but the boring and non-existing level design hurts the game a lot. The test facilities never really look distinct or inviting, I understand that recreating an entire realistic world is difficult but a little more variation or original level design would have been such a welcome gift for Danger Zone. Gameplay mechanics and graphics are all decent but sound under delivers. Cars don’t sound real, crashing with high speeds lack punch, ambient sound is almost non-existent. A game should be a total package, sound didn’t seem to be that important for Three Fields Entertainment, it is for me though. 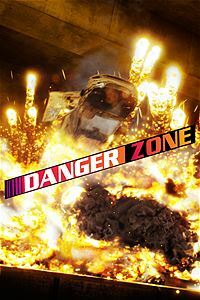 [6,5/10] Danger Zone is not a game that will leave a memorable impression, for the attractive low price and decent enough gameplay gamers will have a good time but I hoped it would be a little bit more. Three Fields definitely has the talent to do more, but Danger Zone isn’t their biggest example of that. I’m curious to see what they do next. 4K native resolution, dynamic shadows, faster loading. Dev: Three Fields Publisher: Three Fields Played on: Xbox One X LifeisXbox received a digital review code, provided by Three Fields Entertainement.